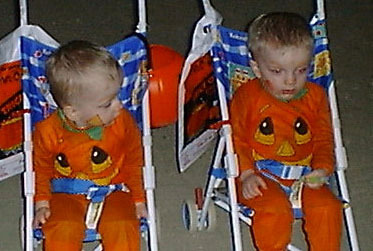 For Halloween, Mom and Dad dressed us up as pumpkins. We went to a park, The Living Desert Reserve, where we went trick-or-treating. For some reason people gave us a whole lot of candy, I think it is because we were so cute. There was one guy that was really scary though. Dad called him Beetlejuice among other things. He scared me, Brandon, really bad and Mom and Dad took us home after that. Then we got to eat our candy.